For the past decade in online poker two HUDs have dominated, PokerTracker and Hold'em Manager. They are the Coke and Pepsi of the poker HUD world. I have written about both of them extensively on this website in the past. And as a long time online professional poker player myself, I have always used one of them. Always having HUD data available on my opponents has helped me win tens of thousands of dollars more at the poker tables. If you take online poker seriously, then using a HUD is a complete no-brainer. However, as many people often point out to me, PokerTracker and Hold'em Manager are not the only two poker HUDs available on the market today. Another option which people frequently ask me about is Poker Copilot. So recently I finally got a chance to test out this poker HUD and see for myself what all the fuss is about. In this article I will give you my complete Poker Copilot review and show you exactly what it is capable of. Is Poker Copilot a viable alternative to PokerTracker or Hold'em Manager? Let's find out! The first thing that struck me about Poker Copilot is that unlike PokerTracker and Hold'em Manager there is no need to install any kind of database software. It just runs straight away right "out of the box." And this is probably because Poker Copilot was originally developed for Macs with the idea of being a super lean poker HUD. In fact, if you use an Apple computer then this is probably the go-to Poker HUD for that very reason. However, if you don't use a Mac don't worry, there is a Windows version of Poker Copilot too. Another thing to note about the Poker Copilot HUD is that it is always running right away on your poker table as long as you are playing on a supported poker room (which is pretty much all of the major ones). So there is no need to switch anything on. 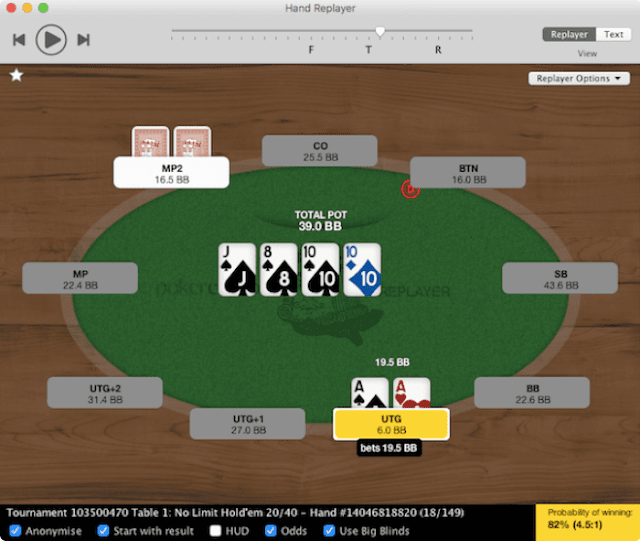 And here is what the Poker Copilot HUD will actually look like on your poker table. You can include whichever ones you want. I would definitely suggest including many (if not all) of the above HUD stats. In fact, as I talk about in my popular best poker HUD stats article, I personally use about 15 different HUD stats while playing online poker. And all of them are available in Poker Copilot. 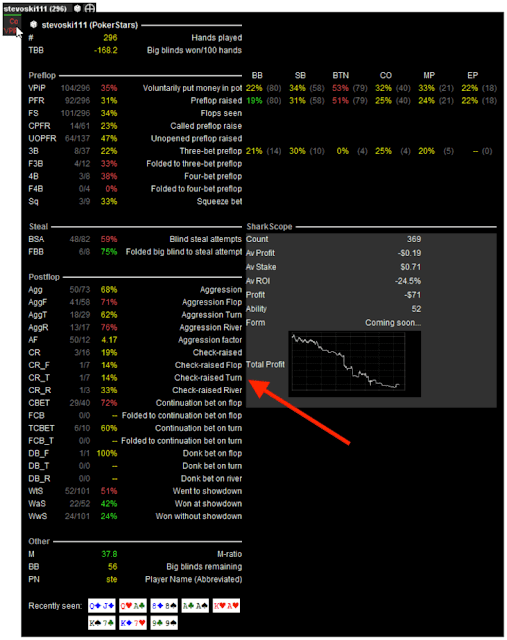 Now is the selection of available HUD stats in Poker Copilot as vast as PokerTracker or Hold'em Manager? From what I see, no. However, I believe that for 99% of poker players Poker Copilot has all of the HUD stats that they could ever need. Much like PokerTracker and Hold'em Manager, Poker Copilot also has an extensive array of HUD stats available in the popup display when you click on your opponent's name at the table. A good HUD popup display is mandatory for online poker because there are many HUD stats that I will use only once in a blue moon (Turn Check Raise% for example). I don't want to have this HUD stat on my screen because I use it so rarely. So I can just bring up the popup display on the rare occasions when I need it. What I also like about the Poker Copilot popup display is that it includes the number of opportunities for you right beside every statistic. As I have discussed before, this is a crucially important thing to keep in mind when interpreting HUD stats. This is especially the case for turn, river and 4Bet HUD stats. And it gives you a score based on how well you are doing. I think this will be helpful especially for a lot of beginners who don't know what their leaks are yet. And this is because it takes all the guesswork out and tells you exactly where you need to improve. It even tells you how well you are playing individual hands (like AA, KK, QQ, AK) as you can see in the screenshot above. Very good for beginners. While I find the leak finding capabilities in PokerTracker and Hold'em Manager to be superior (especially the ability to run hand filters), this is complicated and many beginners won't know how to do this. So once again what Poker Copilot may lack in terms of sheer data and capabilities it makes up in terms of it's simplicity to use and understand especially for newer poker players. Poker Copilot also has full support for tournaments and sit and gos along with cash games. There are in fact tournament specific HUD stats available such as "M-ratio" which is very useful for understanding stack sizes when you get deep in a poker tournament. You will also be able to track all of your tournament results (same with cash games and sit and gos). No more guessing about your results! Poker Copilot does the work for you. 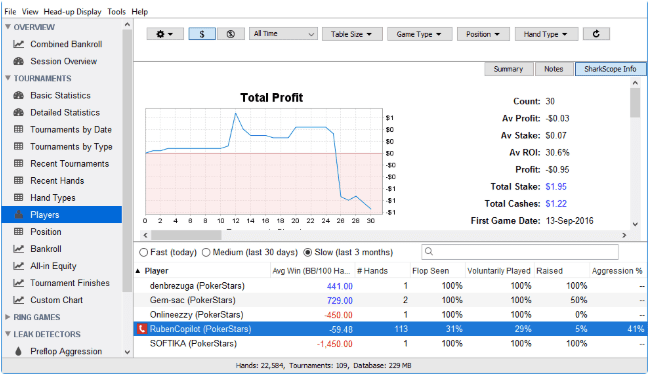 You can also do session reviews within Poker Copilot by reviewing your own hands in the replayer. As I have discussed many times before, this is absolutely crucial to your development as a winning poker player. And what's more, you will also be able to track all of your opponents and review their hands as well within Poker Copilot. This is something that I also highly recommend. I attribute a lot of my success in poker over the years to putting in the hours away from the tables studying my opponents and finding ways to beat them. As a professional poker player, this is an integral part of how we learn to crush the games and stay on top. In Poker Copilot you can do it all. So what is the final verdict on the Poker Copilot HUD? Well, I would say that for somebody who is looking for a simple to use, slimmed down alternative to PokerTracker or Hold'em Manager, this is a good option. Poker Copilot is extremely simple to install and get up and running at the poker tables. It is also compatible with nearly all of the major poker networks and it has a wide array of HUD stats. While it doesn't include as many HUD stats as it's larger cousins, it includes all of the basic and advanced ones that you need. Again, the key here is simplicity. The leak detector function inside Poker Copilot will make it easier for many newer players to find their leaks and quickly start fixing them. This is a major bonus in my opinion. 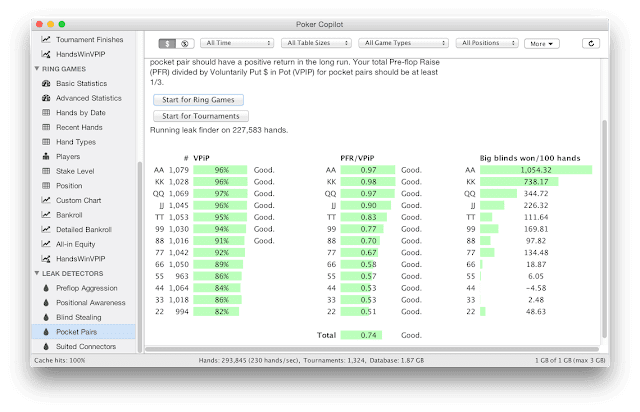 Lastly, Poker Copilot includes the ability to track all of your results (and your opponent's) and then study the hands. This is a crucial part of improving your game and ultimately your results. 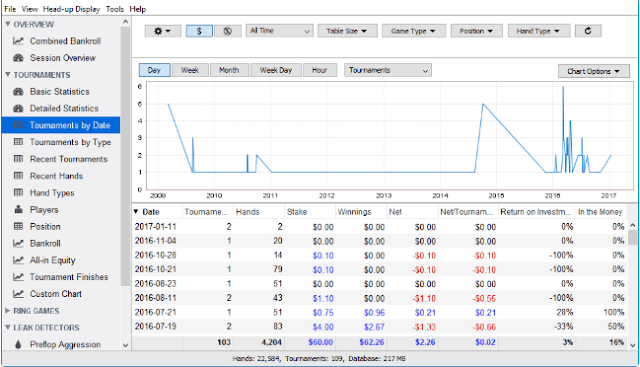 Much like PokerTracker and Hold'em Manager, Poker Copilot offers a 30 day free trial. So you can go install the HUD right now and test it out at the poker tables for yourself at no cost. Again, if you take online poker seriously at all, then getting a good poker HUD program is easily the most profitable investment you can make. To go download the 30 day free trial of Poker Copilot, click here. 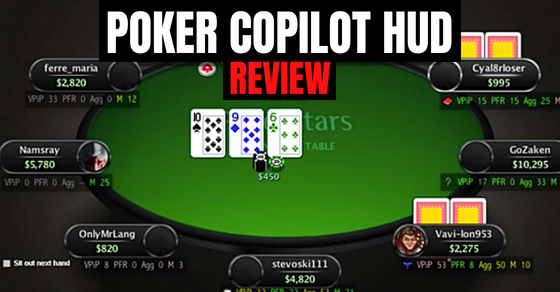 Let me know your thoughts on Poker Copilot in the comments below. Please note that the links in this article are affiliate links. This means that at no cost to you I will earn a commission if you choose to purchase Poker Copilot. If i want to request hand histories from pokerstars(millions of hands) will I be able to import them to Copilot? I don't think you can do this with Poker Copilot. Since the program is meant to be light and fast it is not built on database software. This means no storing millions and millions of hands. Poker Copilot dev here. We've tested Poker Copilot with 2 millions hands and it seems to cope with that. We do use database software, but it is embedded, hidden from the user. The database we use is called H2. Thanks Steve, I stand corrected. That is extremely helpful to know! Do any of these products allow me to create my own custom statistics? If you mean creating some new HUD stat that nobody has ever thought of, I think the answer is no. You could always run it by the development team though and they might add it in a future update. (1) I was wondering, when someone "tilts," what does that actually mean in terms of their decisions? When tilting, what are the top five mistakes people make thay cause them to play poorly? (2) Regarding this article on HUDs, can any of these HUDs be used to verify patterns associated with tilting? If I make four fancy purchases at four fancy places, my credit card company will call right away to make sure everything is ok.
Can any of these HUDs do that? Detect problems and alert you? Check a normally solid player's vpip and pfr and if its out of the ordinary he is on tilt o4 drunk probably.Dunno if there is any alarm you can set on any hud to alert youif player x has vpip>X then... etc. Basically what Jimmy said. 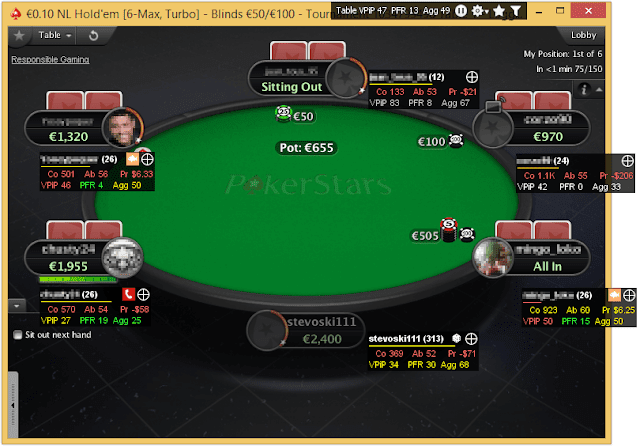 If a 13 vpip / 10 pfr is all of the sudden playing nearly every hand, then he is probably on tilt.